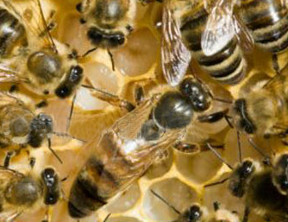 Honey bees that swarm with their queen are docile and rarely sting. What to do if a bee stings? If a honey bee stings, stay calm and quickly remove the stinger. Remember the faster the stinger is removed the less venom is injected and the less painful the reaction. What to expect if you are stung? Unless you have experienced many stings you will probably see redness and swelling around the sting site. This is normal. Expect to feel a little itchy around the site as your body deals with the sting. Ice packs help reduce any pain from inflammation. John Gibeau of the Honey Bee Centre is an experienced bee wrangler. He is preparing a mini swarm (queen with bees) for a bee beard demonstration.